There are days when nothing but a steaming bowl of freshly made risotto will do. This craving comes on strongest in autumn, when the north wind blows, biting cheeks and snatching hats. When the weather turns dark and cold, like a migrating bird, I instinctively build the first fire of the season, while contemplating one of my favourite meals. 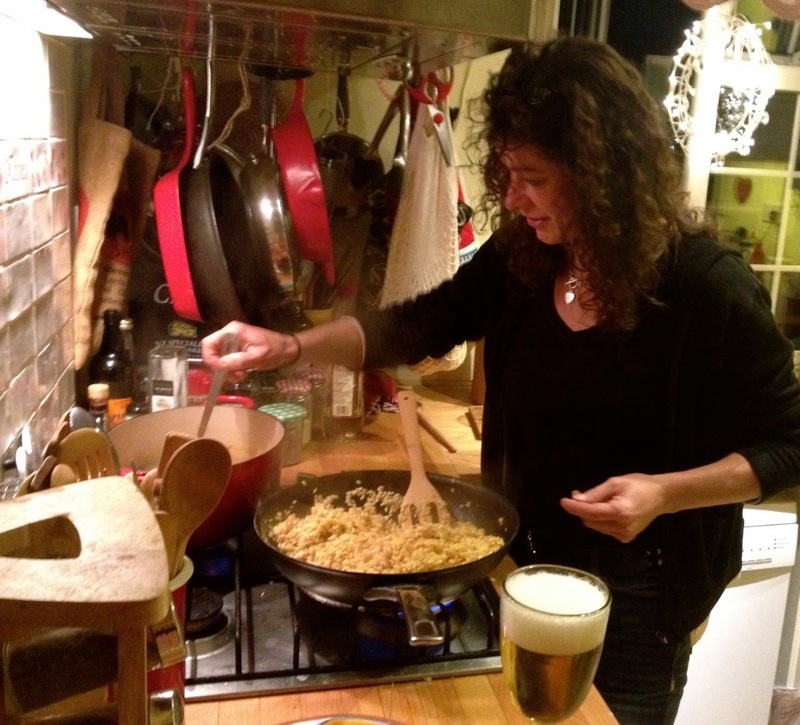 Risotto is as fun to make with your best friend as it is your inamorato. A couple hours before you want to feast, share an antipasti platter (olives, cheeses, grilled Italian peppers and cured meats) with your favorite Italian beverages, while leisurely prepping for Risotto. Then, about forty minutes before you want to eat, fire up the hob and get cracking'. 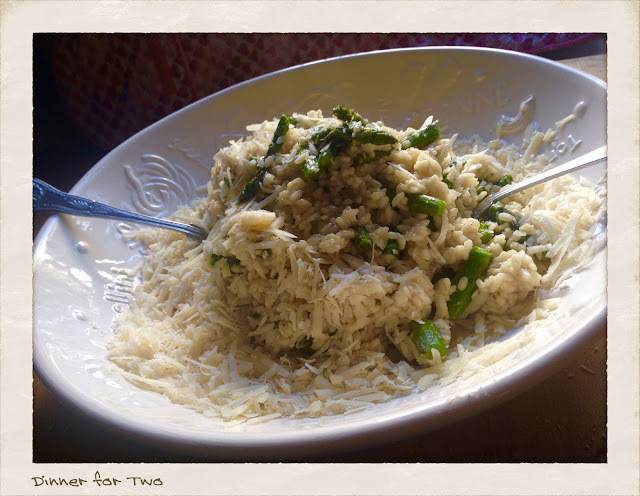 While I adore pumpkin risotto in October (see index) and asparagus risotto in spring, my favourite of all risotto is simple, unadorned, cooked-in-slow-motion with a handful of quality ingredients. My vision of Risotto is made with olive oil; Echalion Shalotts; Carnaroli Rice; rich, homemade, roasted chicken stock; Parmigiano Reggiano: pine nuts, and a pinch of saffron. Ideally, prepare risotto after you’ve roasted chicken and cooked up a pot of strong chicken broth. The two ingredients that ultimately determine a great risotto are the quality of the stock and the specific rice used in the dish. I make this for two. No more. No less. Two, served in one, big sharing trough, with no other accompaniment, save for perhaps a few sips of ice cold Prosecco or Peroni, between bites. In reality this recipe makes enough for four, but that changes the mood considerably. Four's a party. This is not a budget dish. You can feast joyously on this complex, satisfying meal for about £20. When compared to dining out, even with a nice bottle of wine, it’s a bargain. And, I hasten to add, I’ve never had Risotto this good in a restaurant - not even in Italy. Put on some opera, or at least an Italian composer. Gregorio Allegri’s "Allegri Miserere Mei Deus" always has me in tears, but with food this seductive, intense emotion is the order of the evening. * Echallion Shallots are long, amber coloured allium, also known as banana shallots. They’re a cross between an onion and shallot. Easy to work with, slightly sweet, with a light oniony flavor. ** Parmigiano Reggiano can be quite salty. If your chicken stock is citrusy or salty, go light on the cheese as it can easily over power this rich, delicate dish. 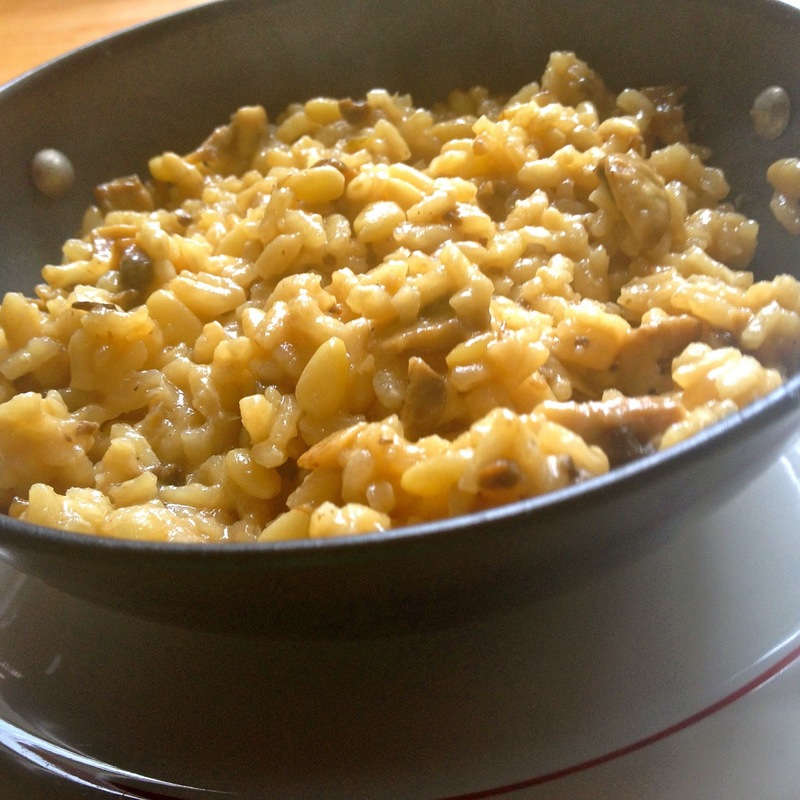 *** If you want to eschew chicken stock and go pure veggy, try my mushroom risotto at the bottom of the page. Gorgeous. I like to give myself an hour to make this dish, excluding the homemade stock. • Heat stock on back burner, over medium heat. You want to keep the broth gently simmering away the entire time, as it needs to be very hot. Have a ladle handy for dipping into the broth, one ladle at a time, as you make your risotto. 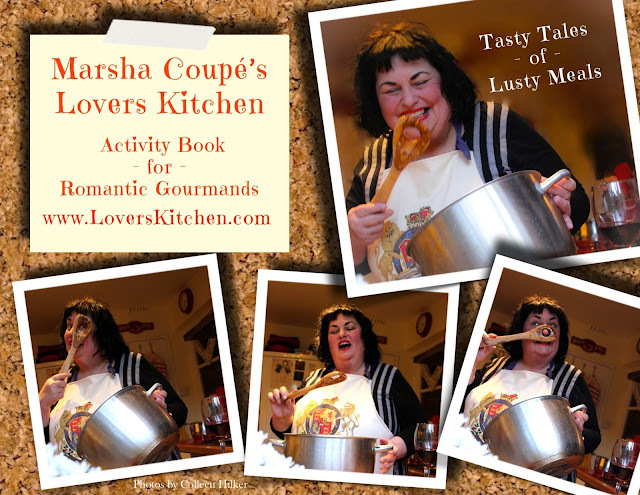 • Peel and finely chop shallots. Set aside. • Toast pine nuts in hot oven until golden, about 15 minutes. Set aside. • Grate the cheese and set aside. • Open the rice, don't rinse, you want all the starch you can get from it. Set aside. • Pour olive oil into large, heavy-bottomed pan. Warm it up over medium heat. Add chopped shallots. Cook until tender and dark golden brown, about 12 minutes. Stir in the saffron. Mix well. Add the rice, coating with the shallots and saffron for 3 or 4 minutes. Tip: Stir the rice in only one direction, whichever is most comfortable for you, but in only one, circular direction throughout the process. This encourages the rice's creme. 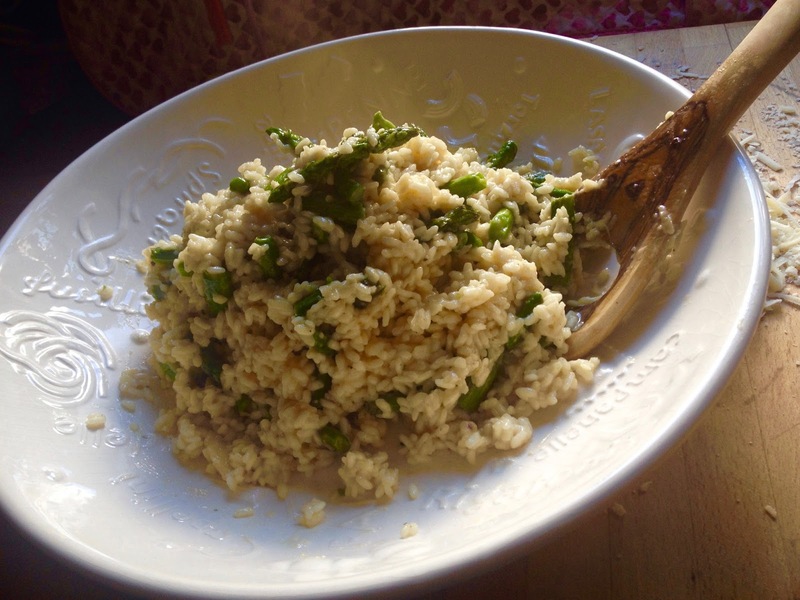 • Over medium heat, stir in one ladle of broth at a time, until fully absorbed by the rice. Do not rush. You’re making love here. Add another ladle of broth. Slowly stir rice until all the liquid is absorbed. Continue with the rhythm of adding hot stock, one ladle at a time, and stirring the rice in one direction for about 20 minutes. Taste. The rice should be tender and creamy, but not mushy. I like my Risotto al dente. You probably won't use all the stock, but it's good to have extra on hand. After 20 minutes, if you haven't achieved the texture you want, try turning up the heat, just make sure you keep stirring in a single direction. 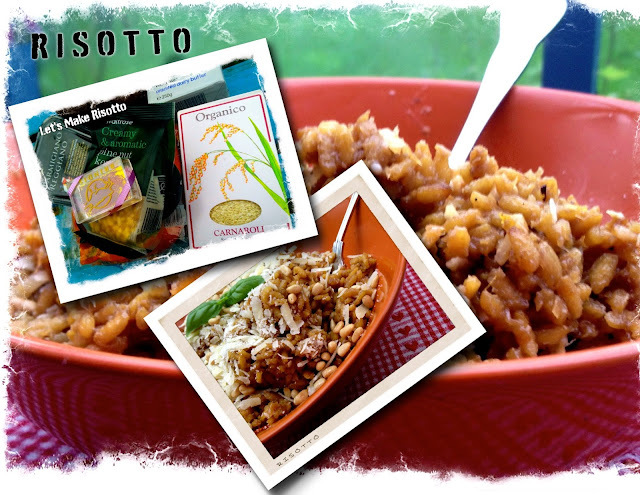 • When the texture and taste appeal to you, remove rice from heat and stir in the toasted pine nuts. 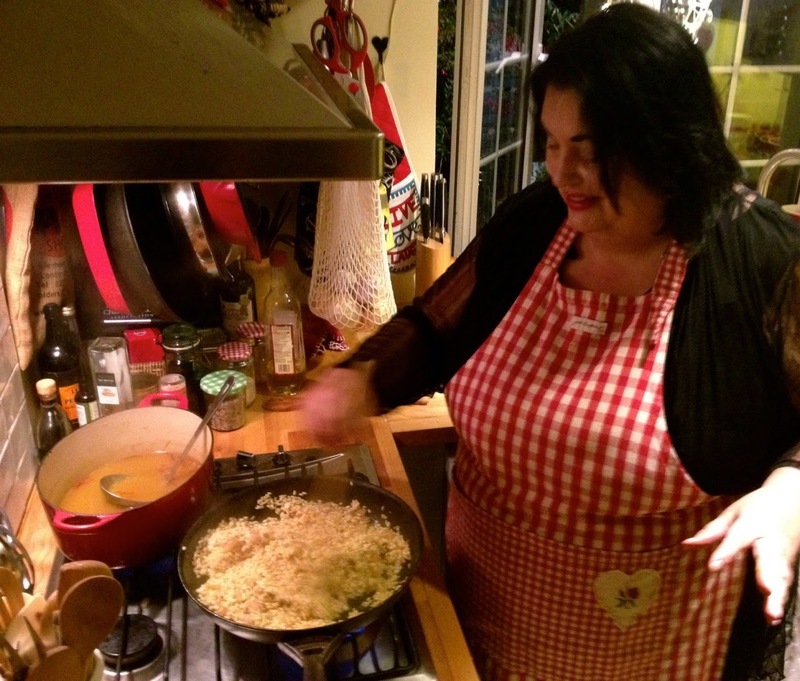 Transfer Risotto to a large, shallow sharing bowl. Top with the grated cheese. Grab a couple of forks and dig in. 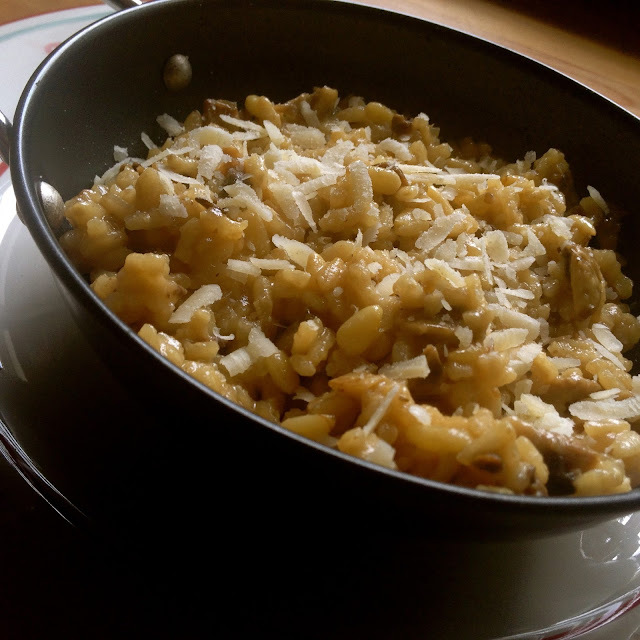 Should you have leftovers (perish the thought) the best way to reheat risotto is to gently steam in a heatproof bowl. This way it tastes just as fresh as when you first made it. If you prefer to go 100% veggy, make a beautiful mushroom stock using dried mushrooms and white wine. Combine 160g of dried mixed Forest Mushrooms with 1-tbs Italian dried herbs and 1-1/2 liters/6 cups of freshly boiled water, in a large heatproof bowl. Mix well. Cover for an hour or two, then add 500ml/2cups quality white wine (I usually go with Sauvignon Blanc) 2 tsp quality, coarse sea salt and 2 tsp coarse ground black pepper. Transfer to a heavy bottom stockpot. Bring to boil, turn heat down to very low simmer. From here refer to recipe, picking up with the shallots. No need for saffron as it would be lost here. Instead of basil garnish with wild rocket. 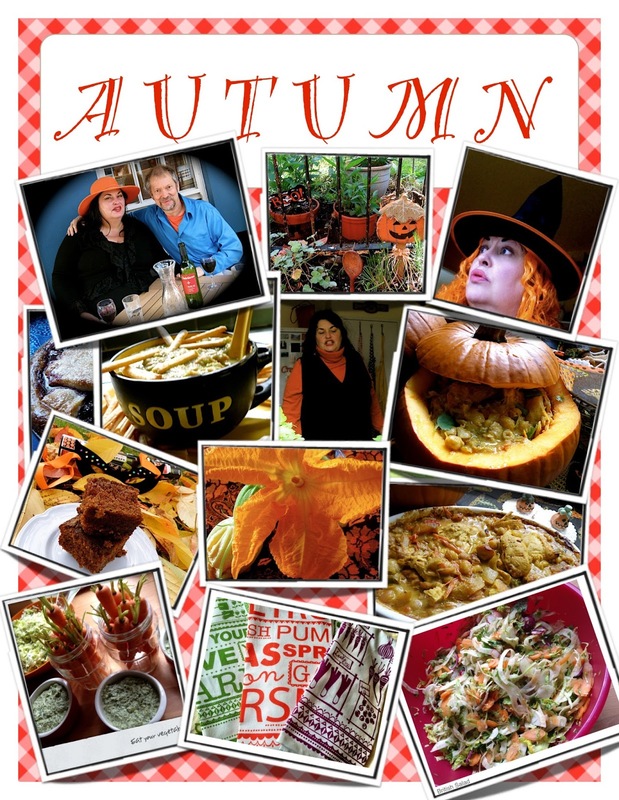 There's more recipes under Pumpkin Risotto. If you want to celebrate life as a true sybarite, bake a New York Cheesecake, top with French apricots and toasted, California almonds. Served with dainty cups of Espresso, or perhaps a bit of ice cold Limoncello, poured over vanilla ice-cream, in a martini glass ala Rosa Cirafici.